Hampshire has once again been up there with the best at the RHS Chelsea Flower Show. With Hook-based nursery Hortus Loci growing for four show gardens, there was always a good chance that their horticultural skills would attract top medals. 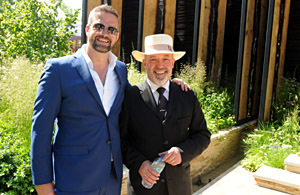 The title sponsors of the RHS Chelsea Flower Show commissioned award-winning landscape designer Cleve West to create a contemporary paradise garden which impressed the judges. He was awarded Gold. Invented by the Persians more than a thousand years ago, paradise gardens are spaces for sanctuary and contemplation. Cleve is known for designs which combine the classic with the contemporary and for The M&G Garden he used ancient elements of water, shade and planting to create a paradise garden fit for 2014. The result is a showcase of how British garden design has evolved yet retains many features that have stood the test of time. Also winning gold with Hortus Loci plants was Chelsea first-timer Hugo Bugg with the RBC Waterscape Garden – Embrace the Rain. The garden showed how water management features which occur in nature can be replicated in bold and innovative ways. Mimicking the natural watershed, water was directed through the garden at different gradients and speeds. Drawing on inspiration from the parched effects caused by extreme global weather, the design was layered with naturally-occurring geometric patterns. The resulting angles exposed and concealed sections of the garden, enticing visitors to walk round and through the space to find out more. The garden included innovative and sustainable concrete applications, showcasing a new moulding procedure and resulting in dramatic and creative surfaces. Blues, lime-greens and yellows were the predominant colours in the planting scheme including Iris bullyana, Iris robustra ‘Gerald Darby’, Euphorbia ‘Whistleberry Garnet’ and Geum ‘Lemondrops’. A variety of plants had different roles in the garden’s filtration, rain garden, and retention pools, inviting unusual combinations and contrasts including Juncus inflexus, Lysimachia atropurpurea ‘Beaujolais’ and Amsonia tabernaemontana. The garden showcased storm water management and alternatives to lawn and traditional paving. In retaining water, opportunities for biodiversity will be increased – for example, frogs and newts. There was a range of trees, grasses and herbaceous perennials which attract, give shelter to, and provide food for birds and insects. The Brewin Dolphin Garden by another Chelsea first-timer, Matthew Childs, won Silver-Gilt Flora. It captured the tranquillity and calmness of a fresh morning. The garden is about possibilities and nurturing potential for the future. The still, restful spaces surrounded by fresh, lush planting reflected Brewin Dolphin’s long heritage of cultivating and preserving wealth. Archways, generous paths and sculpture are all symbolic of future opportunities set within a peaceful space. The garden was designed in a contemporary way for a professional couple to provide them with a place in which to relax. It features bold, engaging elements such as patinated copper archways and a specially commissioned sculpture designed by Peter Brooke-Ball. The planting is a fresh colour palette of greens, yellows, whites and creams with a delicate mix of perennials, ferns, hostas and grasses. These weave beneath the dappled canopies of multi-stemmed Betula nigra and Acer and are punctuated with the dense, loosely globe-like forms of Cryptomeria japonica ‘Globosa Nana’. As with the hard landscaping, there are contrasts in mood within the planting with accents of claret and purple which symbolise preserved wealth from a nurtured approach. Although not designed to be specifically from one geographic area, there are strong Asiatic influences within the planting scheme. The Cloudy Bay Sensations Garden by Gavin McWilliam and Andrew Wilson also won Silver-Gilt Flora. It was designed to reflect the tasting notes of the Cloudy Bay wines. Using this as the basic concept, planting and flower colours, perfumes and textures are used to visualise the sensations experienced when drinking the wine. Flower colour is used to create a splash of sensational shades across the garden. Deep blackberry notes contrast with raspberry reds and softer pinks, drifting into frothy whites and pale gooseberry tones. Roses, irises and peonies create intense colour depth and perfumes, set against a simple palette of oak and hazel coppice, woodland grasses and sweet woodruff. Gooseberry, raspberry and redcurrant are dotted through the naturalistic planting. To the front of the garden the colour planting drifts into soft ornamental grasses and bulbs. A specimen medlar and a pomegranate create foreground interest. Oak and charred oak are combined with limestone surfaces and sparkling water to complete the design as a garden of sensory delight. Tall oak panels create a sense of elegance and oak and hazel coppice with woodland fruit contrast the drama of the colour swathe that splashes across the garden. It’s not just the Show Gardens that wowed the judges. Hillier Nurseries, the UK’s leading tree and hardy plant nursery, are celebrating their 150th anniversary in style this year. They created a show-stopping exhibit at the heart of The Great Pavilion sponsored by specialist insurer, Beazley. Hillier has been exhibiting at Chelsea since the show’s early days, and has won an unrivalled 69 consecutive RHS Chelsea Gold medals since the show resumed at the end of the Second World War. The Hillier Garden Exhibit showcases around 4000 readily available garden plants and container-grown semi-mature trees taken from its extensive commercial Hampshire nurseries. Also on display is the Plant of the Year – Hydrangea macrophylla Miss Saori (‘H20-2′). The unusual double-petalled pink and white flowers look stunning. Joining Hillier’s in the great Pavillion is Hardy’s Cottage Garden Plants. The Whitchurch-based nursery introduced three new plants this year – Gaura lindheimeri “Freefolk Rosy”, Eryngium “Neptune’s Gold” and Trollius “Dancing Flame”. As well as showing off their new plants, Rosemary Hardy is now the proud owner of another record breaking RHS Gold. Rosemary is the most successful ever female exhibitor and now holds her 20th Gold. Hampshire Carniverous plants are also showing a new plant, Sarracenia ‘Matt Johnson’. The new hybrid Sarracenia, bred by Matthew Soper is getting its first public showing. The parents are S. × exornata‘Peaches’ × S. × catesbaei giant. It is now mature at seven years old from seed. Its huge bright yellow overhanging lid, which can reach 25cm across, makes this striking plant really stand out from the crowd. The plant produces large nodding red flowers with long peach‐pink petals in spring. band The The who attended on press day to see his plant. 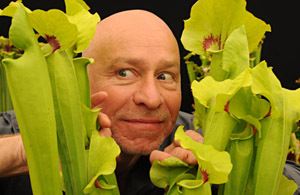 We asked Matt Johnson what it feels like to have a plant named after him; “It feels very flattering, particularly a man-eating plant, or a carniverous plant, or a Matt-eating plant! It’s very nice,” he said. Matt doesn’t yet have any carniverous plants at home but will definitely be taking a Matt Johnson home. Their stand was awarded Gold – Matt Soper’s 16th. Also in the Floral Marquee are Ainsworth Displays who achieved Gold for their display of hardy and half hardy palm trees and Heucheraholics who were awarded Silver-Gilt Flora. 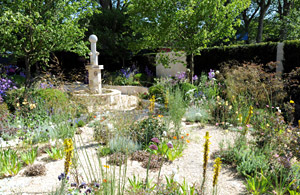 Hampshire designer Sarah Eberle has designed eight Gold medal-winning gardens at RHS Shows. This year she designed the Gucci Fresh Garden and added a Silver-Gilt Flora to her medal tally. Gucci’s Flora garden, celebrates the Flora fabric scarf designed by Vittorio Accornero in homage to Princess Grace of Monaco. The garden is inspired by the floral bouquets featured the famous scarf which represent all four seasons, and depicts a courtyard space attached to a flagship store in Western Europe. The raised catwalk allows small scale fashion shows and displays to take place while the hanging ‘bouquets’ can be changed seasonally to correspond to the fashion house’s current portfolio. The overhead gantry is used to suspend plants, attach lighting and to support fabric. The chains used to suspend the plants are inspired by Gucci jewellery. The garden is seen as high in maintenance in much the same way as the interior displays within a Gucci store. Two mannequins on either side of the catwalk are reflected by mirrors, making the catwalk appear as if it floats over a carpet of flowers. The catwalk is made of white, seamless flooring, reflecting the background theme of the Flora scarf. “The scarf was designed 50 years ago as special gift for Princess Grace of Monaco. It’s an iconic motif for Gucci and where better to show it than at Chelsea Flower Show? It’s been a wonderful subject to deal with – I can get all that colour and variety of plants. The stress factor is the amount of cut flower and in 27 degrees it’s not easy it’s to keep it,” said Sarah. 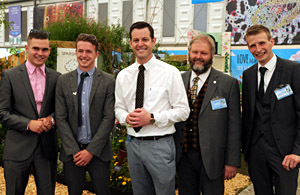 The horticulture students at Sparsholt were the only ones in the Discovery Garden category to win Gold. It was also awarded Best RHS Discovery Exhibit. Their innovative design, under the direction of lecturer Chris Bird, The Paper Chase, demonstrates the complete recycling circle and they have teamed up with two organisations – one of which is a global player – to show how a garden can start with a student drinking a cup of tea which then ultimately ends up as compost. All the plants for the garden have been grown in the compost and the cup-theme of sustainability runs through the entire design. 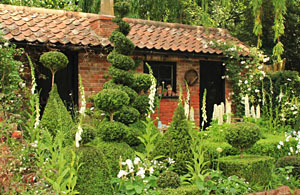 The Topiarist’s Garden in the Artisan category is based on an original concept by Marylyn Abbott for a garden in front of the remains of the bothy at West Green House. It was envisaged as a personal space for a conventional gardener influenced by the tradition of Topia opera “fancy gardening”. Here he could indulge in this small walled space his eclectic topiary designs haphazardly placed amongst his favourite perennials. Alongside in a sunken chequerboard of pots favourite bulbs and annuals flower in season making this space a fantasy in formality. The garden was awarded Silver-Gilt Flora. 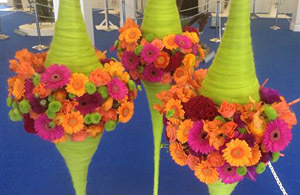 Pip Bensley from Southampton is in the Floral Arrangement Competitions in the Floral Art Design Studio. She is competing in the class “Sculpture in The Garden” and has won her third Gold medal.